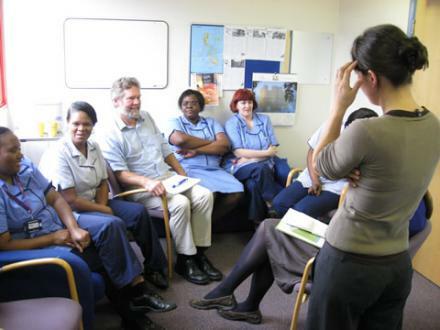 The SAP programme is structured around two facilitated workshops, designed to help staff learn about sustainable healthcare, focus in on their top issues and put together a green action plan. The team then adopts their action plan into routine management of the unit so that it can be regularly reviewed, becoming the framework for ongoing sustainability improvements. SAP can be run with any clinical team – in a ward, outpatient department, home-care service, laboratory, or any other clinical unit. SAP can be run as a stand-alone project, or as part of a coordinated programme across a whole Trust. It is often helpful to have a facilitator from outside the team to help with running workshops and reviewing progress. However, this role can also be taken by an enthusiastic team member, with support from the team lead. The first step is to get the team or team lead on board – make sure they know why they are doing this! Next, decide who needs to be involved: can the whole staff attend both workshops, or would it be better for a smaller team to work on SAP and feed back to the wider group? You can now get some dates in the diary and use the pre-evaluation forms to start people thinking about their top issues. Workshop 1 provides an introduction to environment, climate change and health, explores sustainable development in the NHS and examples of actions taken by other units. The team then debates its priorities and reaches agreement on which one(s) to tackle first. Workshop 2 explores in detail the priorities chosen by the team in Workshop 1. The team draws up its action plan and agrees how to manage its implementation. To maintain momentum get your SAP initiative onto the regular management agenda at the appropriate level. Make sure the cycle of plan, do, check, act is maintained, moving on to tackle the issues put aside for later, taking on new issues, setting new targets. Lavish praise. Use publicity. Continuous improvement should make everybody feel good.